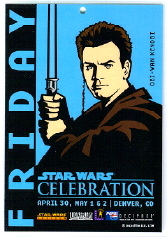 Star Wars Celebration Passes: The surprise runaway hit collectible of the 1999 Denver Star Wars Celebration was the set of colorful entry passes to the event. 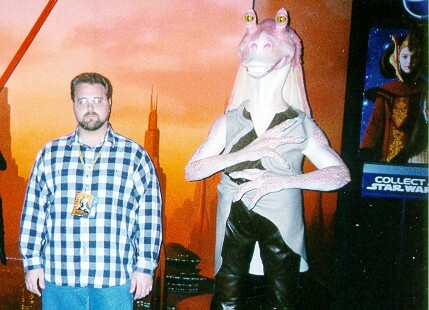 Each pass permitted a specific kind of entry and featured a character from the then unreleased movie, The Phantom Menace. Each pass had a different background color, and there were ten passes in the entire set. The VIP Guest pass was issued to important people and Gary Weaver. 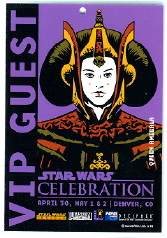 :-) It appropriately features Queen Amidala and has a purple background. The Backstage pass gave holders of the pass fairly wide entry into events. Those holding this pass could enter any event at any time. 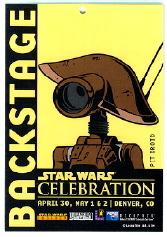 It features a pit droid with a yellow background. 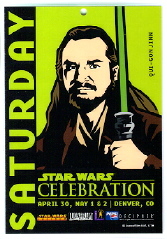 The two Jedi protagonists of the Phantom Menace were featured on Friday and Saturday in their respective lightsaber colors: Obi Wan on the blue Friday pass and Qui Gon on the green Saturday pass. These passes were sold to regular attendees via advanced ticket purchase and at the event, although the event sold out early in the morning on each day. 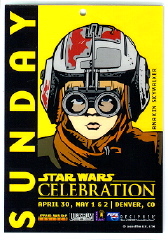 Anakin tops off the one day passes as the featured character on Sunday. The common Three Day passes were worn by the die hard fans who stayed for the duration of the event. 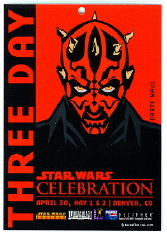 Darth Maul, perhaps the most popular character ever in the Star Wars saga, is shown on this pass with an appropriately matched red background. 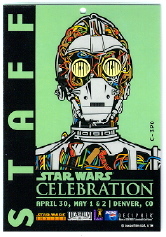 C-3P0 in his new Episode I form was shown on the Staff passes. Not very many of those were seen at the event as they were worn by folks such as the cashiers at the Fan Club store. 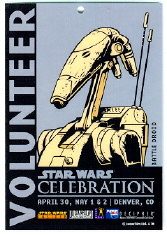 The blue badges with the Battle Droids of the Trade Federation were issued to volunteers and Garry Pedersen. These volunteers helped manage the lines and guide people to events. 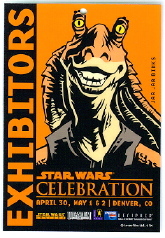 Greg Hanson and exhibitors received the orange exhibitor badge with Jar Jar. This badge allowed early entry into the main hall and dealer area, although it didn't permit early access to presentations as some exhibitor pass holders found out. 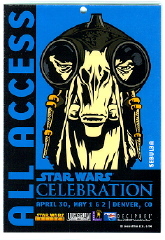 The All Access pass was perhaps the most coveted since it permitted access to any event at any time. It features Sebulba, an appropriate character since he is not bound by the same rules as others.